Head here for discounts and promo codes for 2019 Boston Globe Travel Show! The 2017 Boston Globe Travel Show is set for February 10-12, 2017 at the Seaport World Trade Center. Tickets are $10 online and $15 at the door. Children 16 and under are free when accompanied by an adult. Each year I usually find promo codes for discount and free tickets, but every year it is getting harder and harder to find them lately. If you are interested in attending the 2017 Travel Show, you can use promo code 2TICKETS to get two tickets for $10, so two tickets for the price of one. You can also try promo code WANDER17 or ROSE17 for free tickets to the show, but I’m not sure where they originated from or how long the promo code will last for– so please use them at your own risk. If you are part of the travel industry or media, you can request a free expo ticket but must have proper ID to attend. There is also a Craft Beer Pavilion at the event and tickets are $35 + $2.92 service fee and this ticket includes a complimentary ticket to the travel show. If you are interested in a craft beer event ticket, you can use promo code MABREW to save $5 on a ticket. 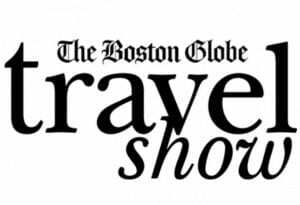 For more information about the 2017 Boston Globe Travel Show, please head here. Have you been to the travel show before? Were you able to score free/discount tickets? Thank you for the free tickets. I create scavenger hunts in book form with stickers included for the Boston area including The Freedom Trail. I am interested in checking out the travel show for business AND personal. Love to travel!! YW! I went a few years ago, and it was a good time– have fun! WANDER17 and ROSE 17 still work.